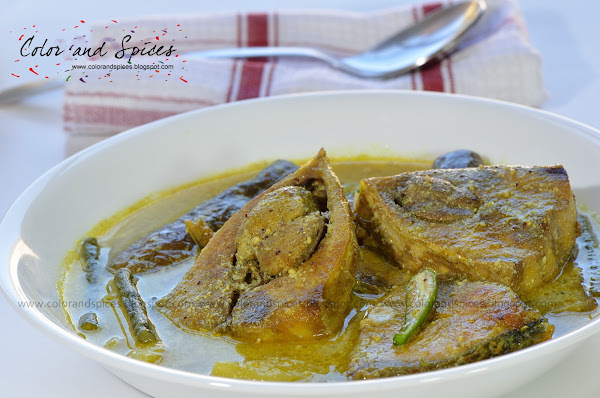 Color and Spices: Ilish macher jhol....Hilsa with vegetables.. 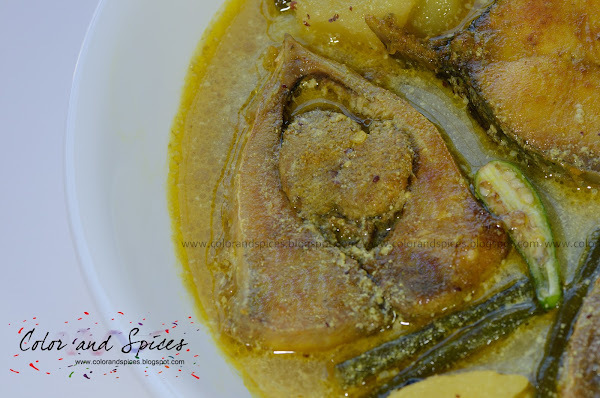 This Hilsa curry with potato, eggplant and long beans is a typical East Bengal(present Bangladesh) style dish. My mother usually makes it during the monsoon as fresh hilsa is readily available in Kolkata during that season. 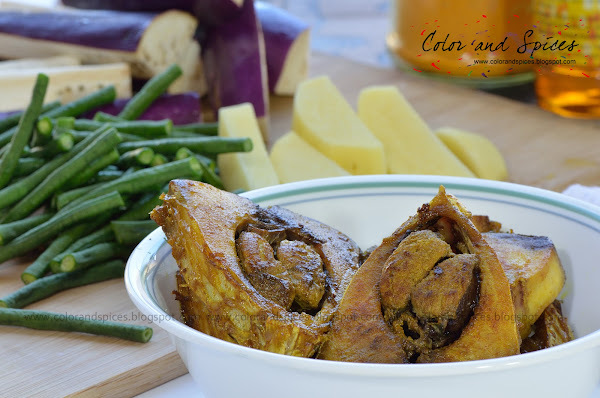 Though our family isn't from East Bengal, we love hilsa fish cooked in all possible ways. My mother learnt it from her very close friend, Manima-Masi. It is a simple recipe. Presence of the gorgeous hilsa combined with eggplant, long beans, potatoes with mustard paste makes it something out of this world. 1. 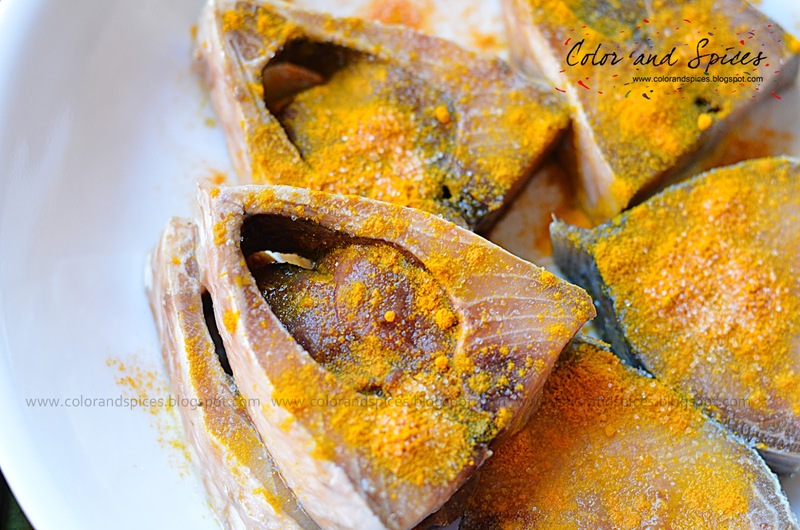 Clean the fish and smear with salt and turmeric powder and keep aside for 30min. 2. Heat mustard oil in a pan with lid or kadai, when the oil is hot lightly fry the fish pieces. 1-2min each side, take out and keep aside. You can skip this stage, as the original recipe suggests to use raw fish. But I have seen my mother to fry the fishes lightly, I just blindly follow her. 3. In the same oil add the black seeds/kalonji/kalojire and 3-4 slitted green chilies. As the seeds splutter, add potatoes and long beans. Sprinkle little salt and turmeric powder, mix well and cook on low-medium heat for 3-4min. Add eggplant pieces, cook for 2 min more. Add water (2cups), and let it boil. As the water boils, reduce heat and add the fish pieces. Add salt, cover the pan and cook for for 5-6min. 4. Make a paste of the mustard seeds with green chilies and a pinch of salt. I soaked the mustard seeds for at least 3-4hrs, so it does not taste bitter. I used 3 green chilies along with the mustard seeds. You can adjust the heat quotient depending on your preference. If you are using only black mustard seeds, better you strain the paste before adding it to the fishes. I used mainly white mustard seeds with just a little black mustard seeds to bring a little color. 5. Add the mustard paste to the fish. Cover and cook on low flame for 5min. Switch off heat. Add 1-2tsp raw mustard oil and few slitted green chilies. Serve hot with steamed rice. What American fish can I substitue for this? The fact is there is no substitute for Hilsa, it has its own unique taste. Best option is to visit your nearest Bangladeshi store to check their Hilsa or ilish stock. I have heard shad fish taste a bit like Hilsa.